As promised, here is the second installment from our 2012 Summer Solstice Wine Pairing Dinner menu. After kicking things off with the super tasty, yet somewhat powerful “Bonsinger Silver Lining” (a lavender infused cocktail with St. Germain & grapefruit), the guests were ready to start the feasting. For the crème fraiche, combine the whipping cream and buttermilk or kefir grains (I tried these on a whim and was surprised at how well they worked, especially after blending the drained kefir for a few seconds when done) in a jar and let sit at room temperature for 8-24 hours (until it’s nice and thick and slightly soured). Process the toasted walnut pieces and ricotta together in a food processor until there are no large walnut chunks left. Set aside until ready to serve (can be made a day or two in advance and refrigerated). Briefly cook asparagus in boiling water (just a minute or two) so it’s still nicely al dente. It will continue to cook a smidge while cooling, so be careful not to overdo it. Set aside to come to room temperature. Slice bread, brush lightly with olive oil and broil in the oven until nicely toasted. Spread a hearty amount of the walnut ricotta on each piece and top with several leaves of arugula, a few spears of asparagus, a drizzle of crème fraiche, a squeeze of lemon, and finally, a few grinds each of salt & pepper. Yum!! I ate this for days after our party and decided it could be a weekly lunch without me ever getting sick of it. I’ll have to play with the veggies as the season’s offerings change. We paired this tasty appetizer with our new favorite white: a Robert Sinskey Pinot Blanc. We recently did a fabulous tour at the Robert Sinskey vineyard in Napa Valley, where they feature wines from organic grapes that are grown with biodynamic methods. Their farm to table experience was awesome, where they paired a range of their wines with tasty local treats ranging from goat cheese to salumi to seasonal fruits. Their Pinot Blanc has just the right amount of herb notes, with nicely balanced sweetness and minerality, to go with the springy asparagus, spicy arugula, and rich walnut ricotta. So good! 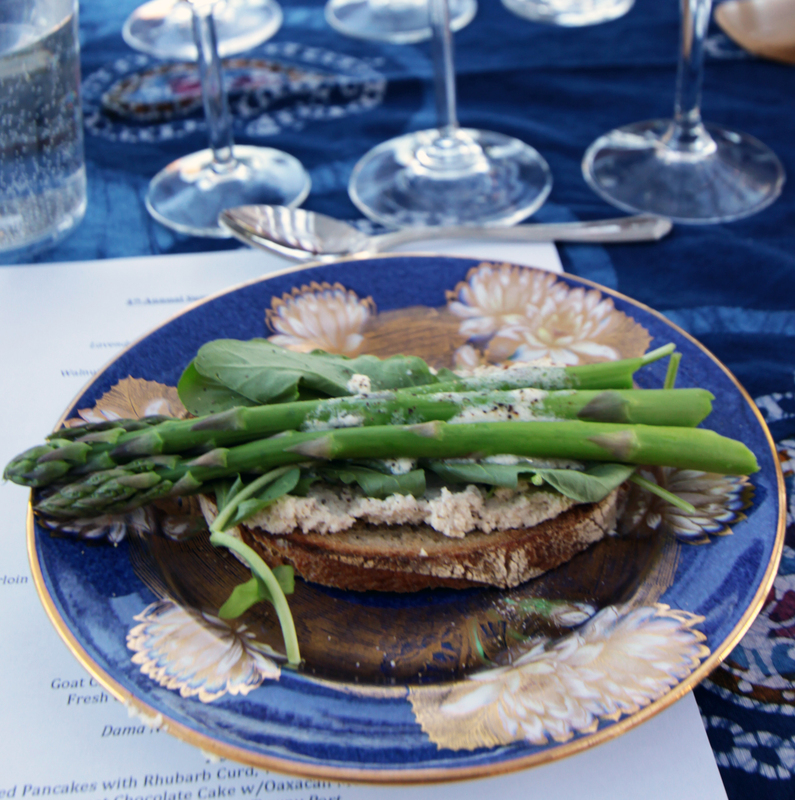 This entry was posted in Appetizers, Recipes and tagged Appetizer, Arugula, Asparagus, Creme Fraiche, Ricotta, Vegetarian, Walnut, Wine Pairing by Brooke Bonner. Bookmark the permalink.